Before heading to the Alamodome for the two 5A state championship football games (with a cigar at the Menger Bar in between), Brad and I decided to hit up a BBQ joint in San Antonio we'd never visited and had only found out about a few days earlier. *Okay, I've gotta pause for a second here. I don't know what your idea of a classic Texas weekend is, but for me, it just doesn't get much better than BBQ, football, and cigars on a Saturday, after going to hear Robert Earl Keen the night before at Floore's Country Store in Helotes. Merry Christmas from the Family live at Floore's 6 days before Christmas: Awe-some. Augie's Barbed Wire Smokehouse, on N. St. Mary's Street just north of downtown San Antonio, has a unique atmosphere. Of all the places we've visited, this is the first one that has a cigar lounge on site. BBQ and cigars occupy about 47% of my life, so Augie's is right up my alley. You can rent the cigar/wine Tree House for an entire night for just $100, and, Augie's will cater your event, if you want. Basically, if you want a venue to eat some BBQ, have a drink and a smoke, and watch a game, Augie's is for you. They've also got a great beer garden out back, with a 12-foot screen for watching games and movies. Behind the seating is the pit, which is an awesome old pit, complete with a huge tree that goes through the roof of the pit. What really stands out to me about our visit is how friendly the staff were. The service was wonderful. From the meat cutter who greeted us to the lady at the cash register to the guy who gave us a full tour of the place, we were treated so kindly. As for the food, the pulled pork was a bit saturated, but I enjoyed it and ate every bit of the huge portion that comes with the 2-meat plate. The chicken was completely dried out and tough, but the sides of corn and baked beans were hot and hearty. Augie's is generous with the portions, so you shouldn't leave here feeling hungry. All in all, the food was all right, but the atmosphere and service were awesome, enhancing the overall experience. Jason knows what was important about Bo's birthday party: the food!!! It’s been a while since my last visit to Salt Lick; but I love coming here. The drive is not as bad as you think…good friends and good food! Happy Birthday Bo! Of course as usual I ordered ‘family style’ what other way is there… I guess you can do plates; I didn’t even eat that much that evening… but you gotta man up! Right? Today was the first time I had the ‘Salt lick Deckle’ Deckle the hall folks but this stuff rules! Now I know why Russell talks about this stuff; I can’t say I’ve had deckle quite like the salt lick’s. it’s still meaty yet crazy moist and delicious. The beef is marbled a lot!! Yes fatty brisket lovers this is what dreams are made of.. one of the best briskets I’ve had in a long time! 9.7 ribs – love the ribs here.. they always make it good. 9.8 potato salad – so good!! I may be too emotionally connected to give an unbiased assessment of the ribs, but I have long been convinced (like 20 years long) that Iron Works has the best beef ribs within the City Limits of Austin (and competes well state-wide). My emotional connection originates from the fact that I have been eating there for two decades and the sheer size of their ribs brings a manly-man smile to my face. It is like stepping into a Flintstones cartoon and sitting down with Fred and Barney to chow down on some kind of dinosaur leg. Simply awesome. Beyond the size, it is the texture of their ribs and the fact that they don't try to do too much to spice or flavor them. It is all meat, baby. And if you like the way quality beef tastes, you will like these ribs. In fact, I would probably rank them close to a "10" if it weren't for the fact that, sometimes, I feel like I am eating a pot roast on a stick because they can come off as "too straightforward" if you know what I mean. That is quickly solved by their sauce, which I generally try to steer clear of when eating BBQ. I jump to sides because, other than a couple of samples of other folks' plates, I don't ever remember eating any other meat than beef ribs. As for the sides, they have standard quality beans/slaw/potato salad and some decent green beans. Nothing special, but worth plate real estate to balance out the meal. Because Iron Work is another rare downtown quality BBQ joint, I give them points for location. Although they have some patio seating and I have had some good meals out there, the view of Waller Creek can be a bit scary depending upon how many diapers, beer cans, and milk cartons you can see on the banks of the creek. I cannot give a fair assessment of Iron Works on food because I never order anything but their beef ribs because they are better than any other place in Austin City Limits. I also don't think they can compete with the experience at Lambert's (although they are cheaper, so I don't hold that against them too much). 1. We're having our first Texas BBQ Giveaway. Enter for chances to win an Opie's koozie, an Opie's t-shirt, or a $50 Opie's gift certificate. Email your entries to manuptexasbbq@yahoo.com. 2. Wanna tell us about a BBQ joint you've visited? Email us your pics and Reader Review. 3. Vote in our 4 polls (blue boxes on right-hand side of the page). 4. Have a recommendation for a joint to hit up? Email us. 5. Follow us on Facebook and Twitter. 6. Connect with other Texas BBQ enthusiasts via the Texas BBQ group on Ning. B-rad spreads the love: mousepad, bad, puppy shirt, and mug!!! He got some for his parents, who were awesome before the gifts. Now, it's not even fair. Merry Christmas from Man Up!!! Merry Christmas from all of us at Man Up Texas BBQ and from the pride of Kerrville, Texas. And a hearty holiday shout out to Russell, who sponsored a young man for the Austin YMBL's Sunshine Camps Holiday Toy Drive. A Man-Up t-shirt was among the gifts! Landed in Birmingham 2 hours ago. It took me 25 minutes to deplane and get my bag, but it only took me 15 to get to Full Moon Bar-B-Que in Fultondale for lunch (See Full Moon pic from last month.). Large pork sandwich (outside chopped), with pickles and chow-chow. Did the best I could taking pictures inside a moving car. #1: Who is Opie? The name of each person who answers correctly will be put into a Man-Up trucker's hat, and the name we pull out will receive a free Opie's koozie. #2: What year did Opie's Barbecue open its doors, and what year did they move into their current location? Must get both years correctly to be eligible to win. Winner takes home a free Opie's t-shirt. Same protocol as for #1, except that if you name the correct month and year (for both questions), your name will go in the hat twice. #3: The best response to "Why Opie's is the best BBQ in Texas" will receive a $50 Opie's gift certificate. *Giveaway rules: You are welcome and encouraged to enter all 3 but may only win 1. All winnings may be collected at Opie's. Deadline to email entries is January 31. Man Uppers (and their relatives) and Opie's employees (and their relatives) are not eligible to win. 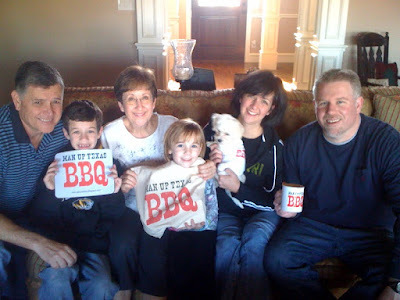 Introducing Man Up's newest blog feature: "Texas BBQ Giveaway"
The holiday season got me thinking that it would be nice to start giving something back to our loyal readers and to put even more of a spotlight on the great BBQ joints that, day in and day out, feed all of us the Texas BBQ we love. So, I'm reaching out to some Texas BBQ joints to make it happen. 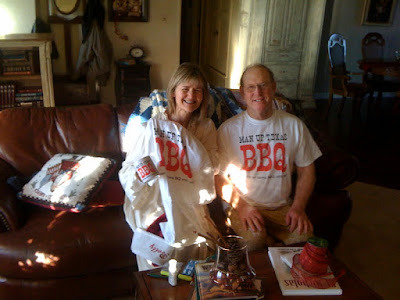 From time to time, we'll be awarding some goodies from various BBQ joints to the winners of our giveaway contests. Later today, I'll post the first giveaway. We're hoping for great response, so spread the word! QOTD: How should it be spelled? Back in Austin. Back to Rudy's. New series on TLC: "BBQ Pitmasters"